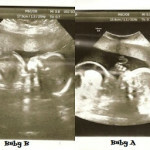 Our daughters are monochorionic-diamniotic (Mo/Di) twins – one placenta, two sacs. 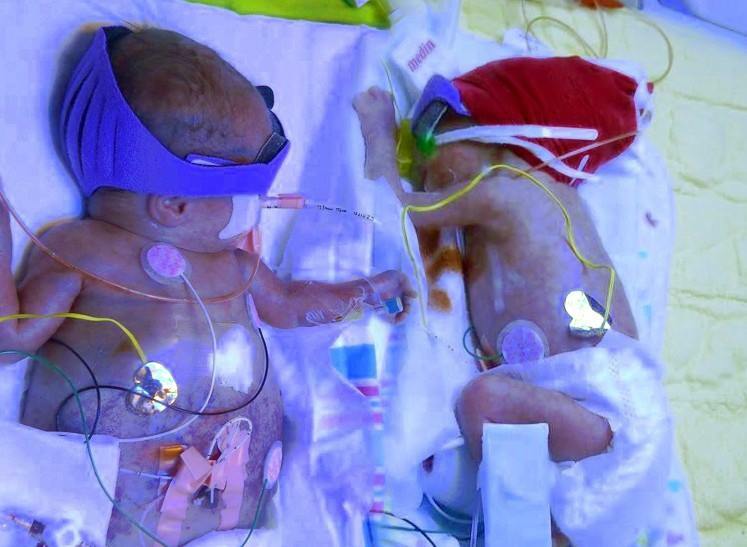 Twin to Twin Transfusion Syndrome (TTTS) occurs in roughly 15-20% of Mo/Di twins, and sadly is the cause of more deaths of babies each year than SIDS, yet it is still relatively unknown and often not treated when and how it should be. Sadly, as I begged my OB to tell me what we could do, she doctor told me “nothing could be done” to save them. And then she admitted me into the hospital. That day as they wheeled me to Labor and Delivery, I thought I was losing both of my babies. I am sure half of the hospital heard me wailing and sobbing as the Medical Tech wheeled me across the hospital. Thankfully, that doctor was wrong. And since then I have come to realize that many OB/GYNs know very little about Twin to Twin Transfusion Syndrome and because of this lack of knowledge, babies are lost. September 28, 2011 I was hospitalized immediately. The next morning the Maternal Fetal Manager (MFM or high risk OB/GYN) visited me and began to tell me about our options. We could do nothing, and both babies would die. 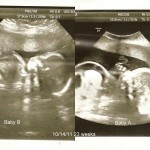 So on Thursday September 29, 2011 we had our first amnio reduction at 20w3d. It was amazing to watch. It was somewhat uncomfortable to have the large needle inserted into my abdomen, but it was cool to watch the babies. For almost an hour they withdrew fluids out of Kathryn’s sac. Kathryn tried several times to grab the tip of the needle. It was cute. 500 ML of fluid was removed from Kathryn’s side of the sac. Over the next several weeks we held our breath as we waited for time to pass. The doctors told us we had to make it to 24 weeks to even be considered viable, and at that point, that needed to be our main goal. I went on bedrest (as much as a woman with a four year old and an 18 month old can be!) and we visited the doctors every week for ultrasounds. Amazingly, the babies stayed stable. Kathryn’s hydrops (fluid building up around two or more bodily cavities) did not go away, but it remained stable. Baby B was growing very slowly but she continued to grow, her bladder continued to be visible, and although she was “shrink wrapped” in the membrane separating the babies, she was not “stuck.” Her fluids stayed right around 2-3 CM, which was an acceptable amount and allowed her to continue to get nourishment, albeit very little. At 24 weeks we took a turn for the worse. 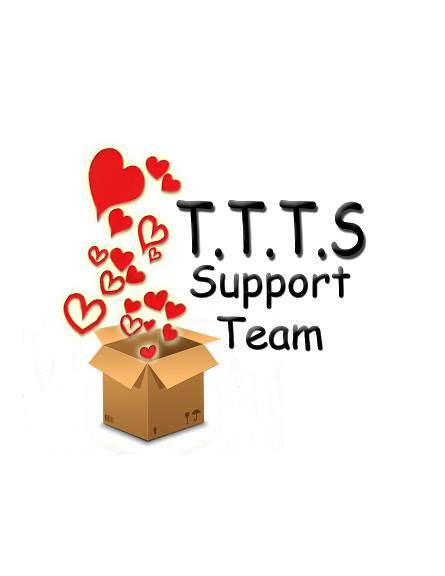 Kathryn’s heart was worsening… the tricuspid valve was no longer functioning, and the fluid continued to build tremendously. Her abdomen, at 24 weeks measured the size of a baby at 32 weeks gestation. 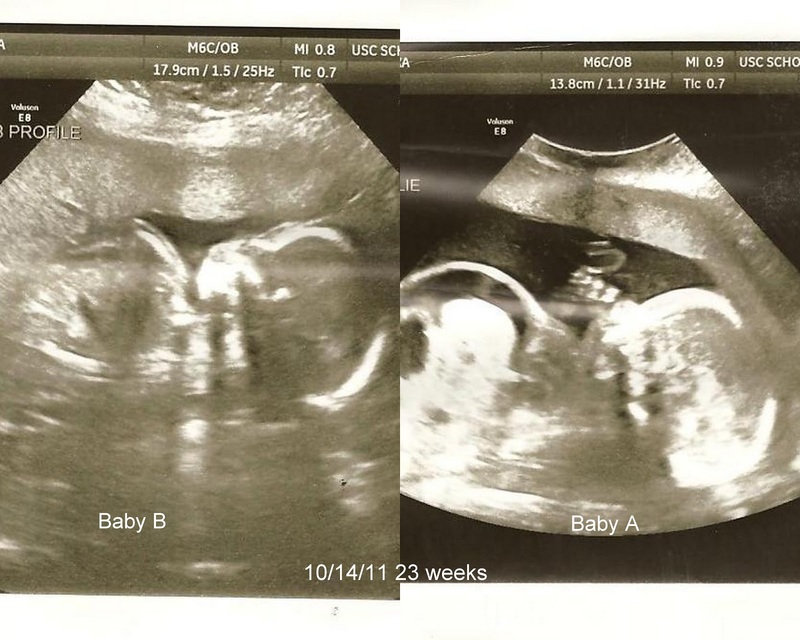 Baby B was still too tiny to be viable, and this was a scary day. We were once again admitted to the hospital, and this time, since we were at the 24 week point, I was put on magnesium sulfate (AWFUL!!!!) and given steroid shots to help prepare their lungs. Three days later, on 10/27 (24 w and 3 Days) we had our 2nd amnio reduction as well as a pericentesis… this time they also stuck a needle into Kathryn’s abdomen and withdrew over 200 ML of fluid out of her belly. The highest risk with these procedures is that they can cause pre-term labor. Also, by introducing a needle into Kathryn’s abdomen, there was a risk of destabilizing her. The little baby (Baby B) still had a 0% of survival if we were to go into labor then, (she was only measuring at 22 weeks) so we waited with great anticipation to see if the procedure would cause premature labor. Thankfully the babies tolerated it well, and I was able to go home that evening. In this picture, you can see the fluid (the black pocket) inside of her belly. Kathryn is on the Right. Tiny, on the left, has hardly any fluid in her sac. The following week showed no improvement. Kathryn continued to take on fluids and the little baby was growing very slowly. At our appointment on 11/1 the doctors notes stated: “Baby A has 6.6 Fluid, Baby B had 2.0”; the comment was made that “Twin A has worsening hydrops.” It didn’t look good. All of us cried (the nurse, the u/s tech, me) as the doctor began to offer us other options. One option to consider was going to the Children’s Hospital of Philadelphia (CHOP) to have a tubal ligation – a procedure to terminate Kathryn at this point because she had such a small chance of survival and keeping her alive was threatening the chances for Baby B’s survival. Baby B was still so small, and growing so very slowly. We said no. I was not going to give up on Kathryn, and besides, there were no guarantees baby B would survive either once her sister was terminated. On 11/8 baby B’s fluid levels dropped to 1.2 CM. Not good. The intertwin discordance was 70.5%; but worse, reverse end diastolic flow (REDF) was identified. In a nutshell, she was starting to return fluids back (reverse flow) and this was very bad. We were once again admitted to hospital – and this time we believed delivery was imminent. However, the babies had other plans in mind. Over the next 32 days, I remained hospitalized on fluids and oxygen, and tons of protein. As long as the babies continued to stay stable, we were just going to leave well enough alone. We did have weekly amnio reductions, and another pericentesis (aspirations of ascites) to draw fluids from Kathryn to allow her lungs to try to get bigger. The doctors didn’t really like to talk percentages with me when it came to survival. And when they stopped talking about other options of treatment for Kathryn (at one point they were considering a transfer to MUSC so that she could have surgery on her heart after birth) I knew that they had little hope for her. After we got to about 28 weeks and Baby B was finally over 500 grams, the doc finally started saying he thought Baby B would now have about an 80% chance of survival. He never talked about Kathryn. On 12/10 (30 W and 5 days) I began having large contractions and went into labor. In the best interest of the babies, I had an elected cesarean following the diagnosis of preeclampsia and nonreassuring fetal heart rate testing. 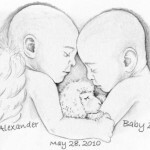 Baby B was actually born first, and from then on became baby A, or “Tiny” as she is referred to in this blog. She weighed 1lb 10 oz but breathed on her own and actually cried at delivery. 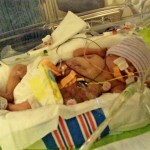 Kathryn weighed 4lb 5 oz (largely due to excess fluids) but was not breathing. Because Kathryn’s swollen belly took up so much room, her lungs were way too small for her body, and she had to be resuscitated and intubated. Although they were able to somewhat stabilize her for the next 24 hours, they were unable to stop the fluid from continuing to build up, and her arterial blood pressure remained too low. 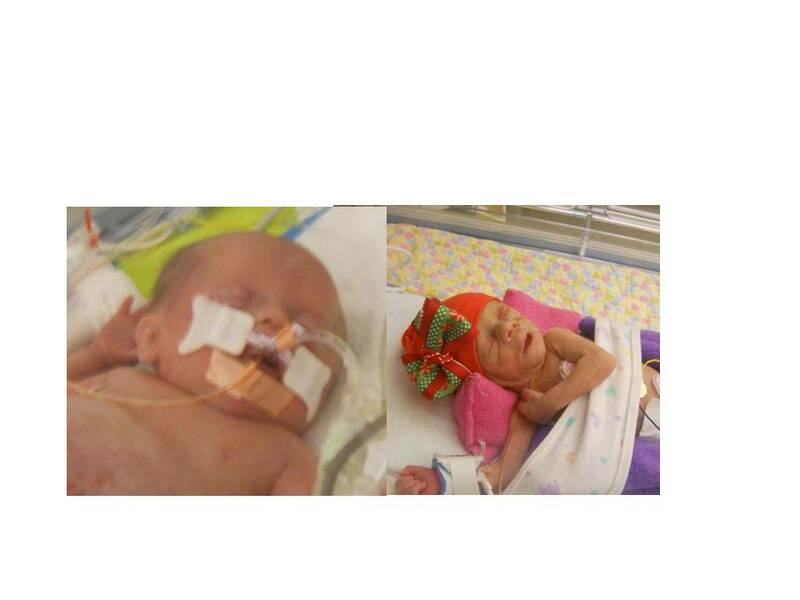 Tiny spent 84 days in the NICU, and other than some eating issues that have since resolved, she has been doing great. Now Tiny is a year old, and we are so grateful for her but we still miss her sister every day. 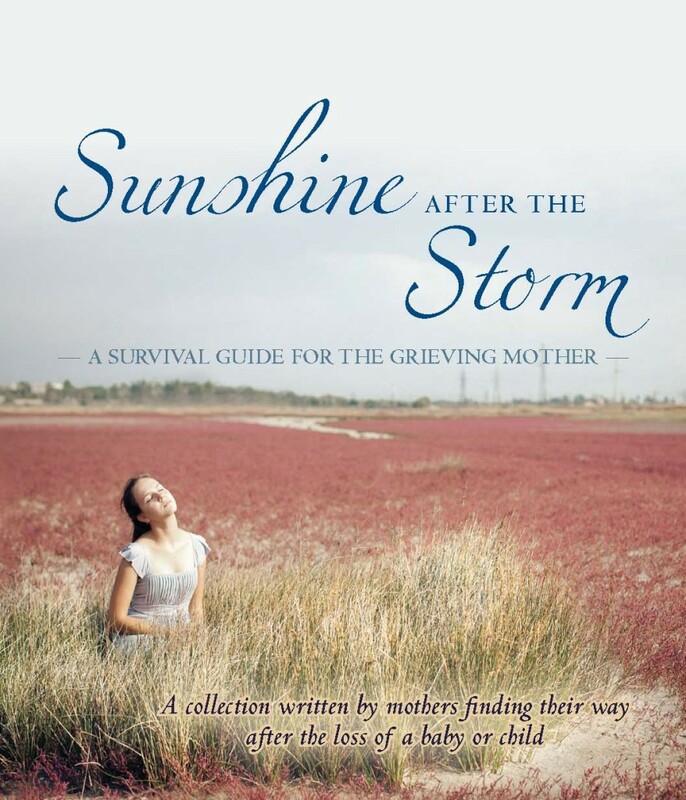 If you have lost one or both of your twins to TTTS, please visit the TTTS Support Team.If you have lost a baby, consider the book that over 30 other grieving parents and I wrote, Sunshine After the Storm: A Survival Guide for the Grieving Mother. Available on Amazon. Thank u. For sharing this! I have 28 week old survivors. We almost lost our little baby they are stil. 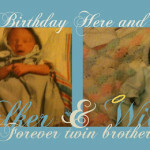 In the nicu you are in my prayers. I am so glad you have double survivors! Amazing! 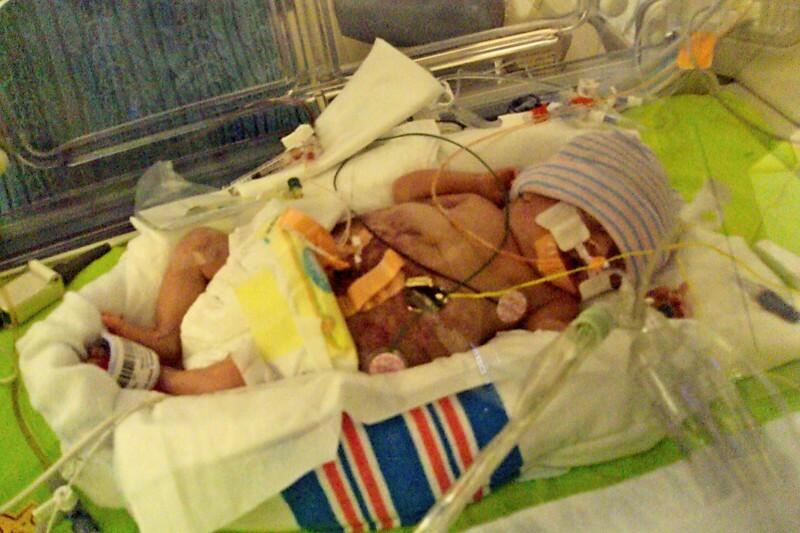 The NICU journey can be tough but you will get out of there eventually! Hope your babies are doing well! I hope you’ll have them both home soon! Prayers with you too! what a story…you should write a book for mothers who are experiencing this…moms seem to help moms sometimes more than the drs.. I am definitely considering it! What an incredible journey, and to write about it a year after, takes the courage and strength of a mom. I hardly blinked while reading this, because I was learning and feeling all at once, and as you know, that’s hard to do in a blog. Thank you for sharing this story, for educating us, and putting a bit of Kathryn in our hearts, too. That means a lot to me. What you said is exactly why I write about it – to bring awareness, education, and to let my baby girl live on! 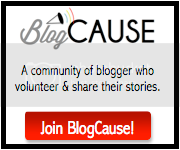 Mothering From Scratch recently posted…What makes you count to 10? What an amazing story! I’m so sorry for your loss. Thank you so very much Colleen! Thank you for introducing us to Kathryn 🙂 And you are a hero for advocating for your child. I wish more doctors would be just as resilient. 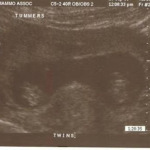 I have infant twins too, but di/di, so we didn’t run into TTTS issues. I know I did read your original story int he past, but thank you again for re-sharing and reminding us all here exactly what transpired during your pregnancy and delivery of both Tiny and Kathryn. Seriously, you are amazing to me always, Alexa and can never say that enough. Hugs, my friend.